A few weeks ago I decided to start a little series called "I really love my...." and my utility vest was an easy piece to start with. A second easy piece? My navy blue blazer. I went back and forth for a long time deciding if a navy suit was worth the investment. I'm fortunate in that I do not have to wear a suit too often for work but I knew I wanted to have a bit of variety especially for the busier spring and summer months. I decided to take the plunge during one of Banana Republic's 40% off sales and I am so glad I did. A previous roommate told me she wore her navy suit more often than her black one and I didn't believe her. Until now. 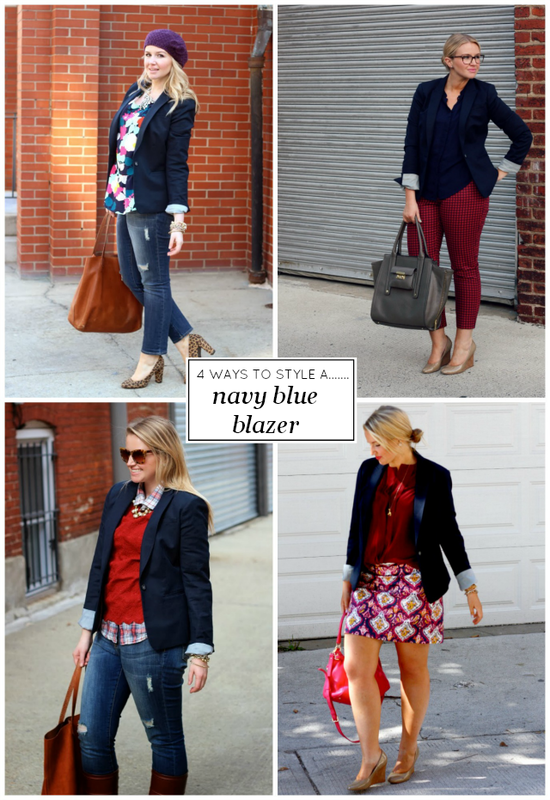 A navy blazer is really a must have layering piece as its so easy to dress up or down. I promise it's actually 100% worth the investment. If you will be wearing it as a part of the suit, you really can't cut corners. Bite the bullet and pay for a nice suit. Just look at it as a professional rite of passage. If you don't plan to wear it as a suiting piece, I would say you're safe with a more budget friendly option. Go ahead and get your H&M on girl. They have great under $50 options like this jersey blazer, this fitted jacket and this single breasted blazer. I also saw this blazer at Target over the weekend and it is really nice quality in person. It's worth considering! Some over $50 options are below..
PS- Linking up with Lauren today! So versatile, love it! I'm looking for the perfect blazer for my wardrobe, so I'll definitely be checking out those links. I love my nabu blazer as well...I wear it all the time! Such a cute blazer! I need to pull out my navy blazer!